Netflix is one of the most popular video streaming services, available in over 190 countries, and allows members to have instant access to thousands of television programmes, documentaries and movies. There is no need to download anything or buy individual programmes on Netflix. As long as your loved one has an internet connection and is happy to pay the monthly subscription, they will have access to everything available on the service 24 hours a day, seven days a week, without a single advert. One of the best things about Netflix is that it is free for all new customers for the entire first month. Netflix allows you to choose which plan is right for each individual and doesn’t have one standard monthly charge, contrary to popular belief. All of the plans below include the option to cancel at any time, unlimited films and TV programmes, and the option to watch on several different devices. £5.99 per month – This plan is perfect for one person and allows the user to watch any content in standard definition on one device. £7.99 per month – This middle plan is suited for sharing the service with one other person and has any contact available in high definition on two different devices at the same time. £9.99 per month – The most expensive plan is ideal for families, with high definition and ultra high definition content available and the ability to watch on four different devices, all at the same time. How to sign up to Netflix? Creating an account only takes a few minutes. All that is required is a valid email address and a credit or debit card, so that the payments can begin after the first free month. Of course, you do have the option to cancel after the first free month. Click the “Start Your Free Month” button, enter the email address and choose a password. Once complete, you can start watching on a number of different devices. Netflix is available on devices such as; laptops, tablets, mobile phones, games consoles and through apps on smart televisions. 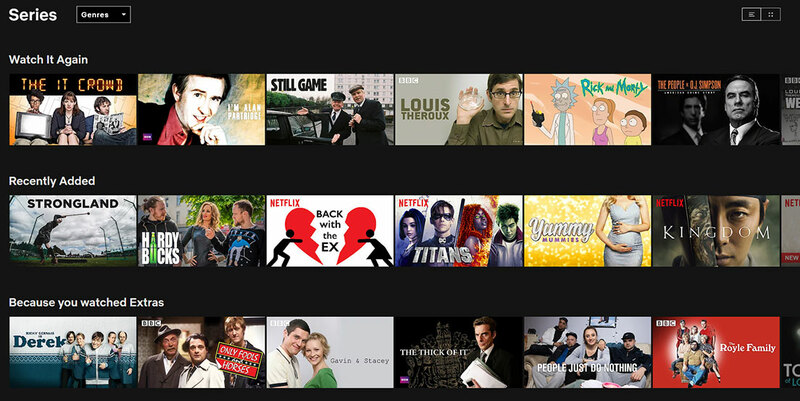 Netflix has a variety of ways of finding TV programmes and movies to watch and content can be found through Search, Recommendations or by browsing through the different genres. TV programme of Movie title. The user can also enable subtitles, captions or alternate audio on many titles. Convenience – As long as there is an internet connection, Netflix is available to watch anywhere, anytime and on thousands of devices. You can also check the compatibility of the devices available to your loved one. Users can play, pause and resume all content without any adverts in between. Create a customised list – Search through the extensive library of movies and television shows and add them to a list to watch later. Content – Netflix has plenty original material with exclusive series and movies that are not available anywhere else. However, the user doesn’t have to watch the original stuff and can choose between all-time classics, British and US programmes, BBC favourites and A-list movies. Variety of the price plans – The user has the choice to pick their own plan at their own price. With three options, the user can determine how many people can share the account and the picture quality. Watching on different devices – Depending on the plan, Netflix can be watched on the user’s iPad on a train journey and if the train journey stops before the programme is finished, they can watch the rest on their TV when they return home and Netflix will even remember where the user was! Download and Watch Later – If the Netflix user is going on holiday, or a long train journey without Wi-Fi, they can download movies from the Netflix library onto their account and watch them without being connected to the internet. This is perfect for flights abroad. Netflix is a great addition for entertainment. If you’re looking for safety, then you should consider a Careline alarm. For more information about the service you can call our friendly customer service team on 0800 101 3333 or contact them via email to info@careline.co.uk. Alternatively, you can fill out our simple Contact Form or order via our website.